Help Kate's car repair empire go global! On the heels of her US success, Kate is expanding her car repair empire across the globe. Set up shops from snowy Canada to the steaming African jungles; buy cars, fix 'em up, add some paint and they're good to go. Just be sure to inspire your customers' generosity by giving them exactly what they want! 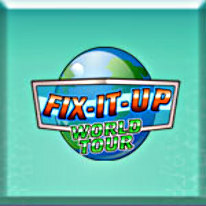 Hire the best and fastest employees, impress clients with environmentally-friendly fixes, and help Kate take on a shady corporation in Fix-it-up II: World Tour.